We’ve already hired and paid a trip to Grand Canyon’s South Rim for the whole day with Scenic airlines. It is located in the state of Arizona to which we’re going to fly. So the plan for today is easy for us: we must be ready at 8 AM to be picked up from the hotel . When coming back to hotel, we will have our last night in Las Vegas in front of us to visiting what we miss the previous days. We wake early today as we don’t want to miss our trip to Grand Canyon, so we’re ready at reception after breakfast at 8 AM. While waiting I’m thinking how this picking up works as there is a long row of people for accessing the desk and I don’t think they will join, and then what if they do? How are we called? As this is a huge casino. Something is wrong here so I ask the women to wait there as I’m going to check hotel’s entrance, but there is all about going and coming cars taken and delivered by the valet. When we’re together again it’s 15 minutes pass the picking up time and I join the row at desk to ask how this trips use to work. I’m told the normal is they pass by a place called “Rotunda” and they give me indications about how to reach it. It is an open area with a roundabout in front of it. There is a van full of people, but it is not for us. I’m thinking about they’ve already passed. I was confident they would call to my cell phone – which number they got – in case of any issue, but now I’m thinking we missing the trip is not an issue for them as it is already paid. So I call to the number in my voucher and I’m confirmed the van passed and informed about the three persons missing. I say we’re going to the airport by our own and they answer if I arrive on time for the flight there is no problem. 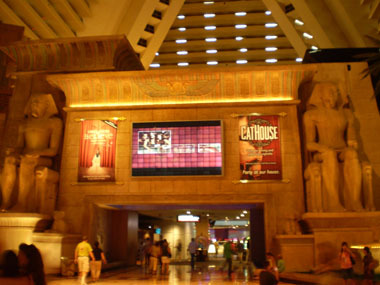 We go to the main entrance of Excalibur hotel (number 0 at map below) and join a small row – which seems eternal to me - for a taxi, which I ask to be taken to the airport. The airport can be seen in the map and it is really close to here, so I can relax as everything seems to be solved. I explain this issue to the taxi driver for he understand our stress, but he comments we should assure where we must go as these kind of trips don’t use to fly from International airport McCarran where we’re going (number 1 at map). So I call again and they confirm it is another airport indeed (number 2). They try to explain how to go there but I don’t know about the references I’m giving for the way. The taxi driver shows his hand asking for my phone and I give to him. I see how they’re getting an agreement so it seems to be going rightly. When they finish I’m delivered my phone back and explained the airport we must go is quite far and it’s going to be 50$. I answer 50$ is nothing if thinking about losing the 1050$ of the trip (350$ per person). 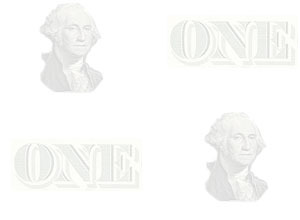 Our taxi driver is a good guy, he has dealt they will wait for us and, when we arrive, he gives us a lower price than those 50$, but I give to him the whole bill as he has well earned it. As the only we can see is three white modules, as ship containers, with a couple of windows and a door, in the middle of the desert and nothing else. We cannot see a single person or dog or… Our driver says he will wait for a confirmation from us everything is ok before leaving. We try to open the door from first module but it is locked. Then we try the one in the second module and it is closed too. Is this some sort of macabre show!? The door for the third and last module opens and we can see a tiny waiting room with a desk in front of it. I ask about our trip and we’re on time, so I’m going out to make a sign to the taxi we’re fine so he can live. This room is a sort of airport terminal. At our right there is the coffee and restaurant area, which here is a coffee and vending machine. Besides there are the gift shops: a display with postcards, key rings and some other small things. Check in desk is a girl after a table and, besides, the door to outside where the aircraft is “parked”, which is the boarding gate. I go to the girl at desk as I want to end with the procedures and complaining about don’t being called and not being explained about the airport when in my first call I said I was going to go directly to there. Was she really thinking the airport I was meaning is that three containers in the middle of nowhere which don’t know even Vegas’ taxi drivers? But before I could do any attack, when I’m identifying me, she strikes first asking me for our passports and saying she know well who we are and we should be waiting at our hotel in time. I explain we were waiting a lot before the time, it’s just nobody told we should wait in a specific point of the hotel. Then she answers it mustn’t be that difficult if after years taking dozens of people from hotels every day we’re the first ones on missing the transport for not knowing where to wait. I’m shocked and don’t react, this girl has just called me stupid and it was so unexpected that I just can say they forgot to tell where to wait to us and wouldn’t for the rest. Anyway, to the hell with this girl, we’re going to see the Grand Canyon and will enjoy it. I’m still must be grateful for being waited. But after 30 minutes seated in the chair with the other tourists I’m feeling as they weren’t only waiting for us. We finally are asked to board and the group goes outside wearing the pink “Scenic” sticker in our chests with proud. In our boarding passes, pink too, we have the assigned seat number but, if the plane looks small from outside, inside it is not for my size and I don’t manage to seat as there is not enough legroom for mine. One of the staff persons move me to the last seat because it is a single one and I can fit on it if I seat sideways. An air hostess stands in the middle of the pass way to explain the typical security information. This is something lived several times before, but here is a bit different: there are just 6 rows of seats and she cannot be completely stood so she must do it bended down and in loud voice. Just when taking off we can see we’re going to enjoy wonderful views during the flight. All passengers are using their cameras through the big windows. We’ve got headphones in order to following the audio guide about what we’re saying, starting by Lake Mead, which appears fantastic in the middle of the dessert. We can see Hoover Dam, which is the cause of the lake and Louis Lane’s death. Yes, I remember well this Dam from Superman movie, where his love dies in the middle of an earthquake because the superhero is busy saving people around. He then decides to save her by the bizarre method of travelling backwards in time by changing Earth rotation direction. A very Kryptonian idea as here humans know rotation is the cause of the gravity instead of the time, so the only Superman was doing is making all the people to float to the sky and then make them fall against the ground when the planet rotates again killing millions of people. What a mistake! In the movie it works, although they don’t answer the question “who is saving all the people now Superman is chatting with Miss Lane?" Obviously, our audio guide is not mentioning anything of that and later on we find out the incredible landscapes of Grand Canyon. Inside the plane, the silence, as everybody is amazed by the views of these huge natural scars in the land. You can see in the pictures how a vast flat and barren land has become in a nature wonder just by the pass of small and continous water caudal and a lot of patience. Flight is so short when you’re watching something so amazing, but we leave the plane quickly thinking the next now is getting a closer look of that. Somehow, we’re got into a coach and delivered some tickets we must show in the theater entrance. It seems we’re going to see a movie first. We go through what seems to be Grand Canyon Visitors Center to join a row of people where we’re checked for the tickets. I go for coke and a popcorn bucket as the rest of people is doing and I’m surprised by the question “What do you want with the popcorn?”. It seems they have a list of stuff to put over them and I make the woman to tell the whole list, then I choose cheese. Popcorn with cheese! 10 seconds after the movie starts we’re done with our snack. The movie is a documental about the Grand Canyon with some parts seeming a commercial for making people visiting it, which I don’t understand as all the people here are in our way to visit it. After the movie we’re back to the coach and I ask to our guide what is going to be next stop: a lookout to Grand Canyon. Ok, now we're talking! Grand Canyon is huge, so big that it goes over different states and, in the most of the cases, it is a nature border between them as any land transport gets truncated by its cliffs. So, the way of visiting it is getting close to one of its rims. That’s why there are defined four points to visit it: West Rim, South Rim, North Rim and East Rim. West Rim is the closest one to Vegas and there are a lot of day trips by road from the city and, therefore, cheaper. Somehow, it seems the best is the South Rim, the one where we are, and it needs air transport from Vegas for a day trip. It is more expensive, but the views from the plane are definitively a must-do. We cannot wait for having these first views from this South Rim, but we can only see pine trees and stones when going out from the coach. We still must walk a little bit to access the lookout, at the edge of the cliff. We need some time to make space between all the crowd in so magnificent balcony. The views are stunning. It’s not the camera is not enough for taking something of so vast landscape, but the eyes are not enough either. These large “wounds” in land are creating a big range of colors, as if the depth could be represented graphically and, in some points, the earth is shown red as if it was raw. The panorama is great but sun and hot air is hitting the visitors. We could be hours spent just by looking to this quiet show, but seated at shadow. We’ve got time enough, though, until time to coming back to the coach is reached, but first we go to the stone little house in the parking area because it is a toilet and we need to use it and refresh a little bit. I take some vouchers about this area, which seems to be called Tusayan. Next stop is for lunching. We stop in a big hotel; it’s not a big building but a large area with small two floored buildings around. I guess it is a working design for a place where space is not a problem. We get into one of these buildings and we can see it is all decorated with a hunting theme. Buffet is upstairs. I’m happy it is an all –you-can-eat because I’m starving but we can easily notice the big differences with Vegas’ buffets: no luxuries and a few choices. But being pasta on it is enough for filling me. This lunch was included in the trip price. Back in the coach we know we’re going to a different lookout. Looking at the info I got before I can see the view point we were before is called “Mather Point”, where the pictures above belong, and now we’re going to “Yavapai point” and the pictures below are for this. On that sort of stone hut in the edge of the cliff there is a big gift store, with a lot of Native thematic, where we purchase a couple of things. The landscape is similar to the previous one, so it is equally stunning. The views are beautiful but is really the size what is most impressive, you can only giving up in front of something like this. When we arrived to this point, the guide told us this is a reserve for the few remaining Californian condors and we can really see a couple of them flying far in the sky. They’re not together, it must be dozens of kilometers between them, but the sight is so open here that you can detect anything in the sky for hundreds of miles. We still have time to see a squirrel and a lizard before being back to the coach for our final ride in Arizona: the one to the airport. On our way, we still have our heads in the canyon. We would want to visit all the rims and going inside it to have all the possible views from this wonder. It is happening at plane too, where we can see it again for a good bye. At least, I’ve been located to a place where I can seat sideways again. Everything is quick once back in Nevada, we’re asked for the hotel to be delivered to and split on different vans depending on the destination. We’re with eight Japanese who go down at Montecarlo’s, and then we get into our room at Excalibur and rest for a while. 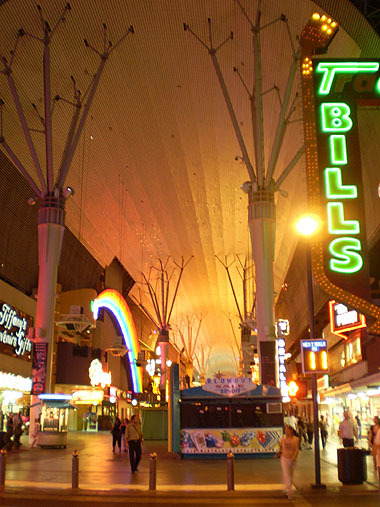 We still have a few things to do before leaving Las Vegas tomorrow: visiting Fremont Street in downtown and Luxor, just besides our hotel, for which we even have a pass way between both hotels and we must dinner in the middle of it . Around 8 PM we take the car to drive to downtown, out of the Strip. Beyond Stratosphere is a new world for us and we can see, without leaving the same street, the typical icons of Las Vegas in our way: express wedding chapels, the famous rhomboid sign of “Welcome to Las Vegas”, only this is adding “downtown” at the end… When we arrive I can find a big parking building where I put some quarters and walk the 20 meters to the lights of Freemont Street through a dark alley where we can see some figures which makes a difference with the Strip: one man shouting to a prostitute and another one walking more like a zombie than like a person. Under the lights of Freemont Street one feels save between so much tourists, but they’re leaving as we’ve just arrive when the show has just ended and the screen is off now. It goes all along the street and we’ve missed to know how spectacular it can be just by a few minutes. The casinos at both sides of this street have a lot of lights and the most of them are very popular, as the Golden Nuggets or the cowboy moving his arm, which is appearing very small in the picture at left. But as this place is getting empty of tourists the environment is getting weirder and we don’t want to get so far from the car. So we do some pictures to the further area and walk back slowly to the parking. There is not a single policeman in this street and we don’t want to be the last tourists here. In our way back we stop at Paris for dinner. We wanted a great buffet but, as it is closed, we take our meal in a Japanese restaurant with views to Bellagio and its fountains. We can see five different performances in the time of dinning. 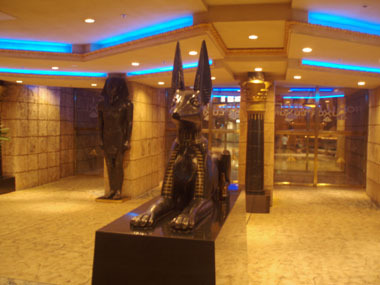 Once in our hotel, free from the car, we walk long underground pass ways to Hotel Luxor. There, it’s all Ancient Egypt thematic. Outside we can see the Sphinx, some big statues and a temple. Behind them there is the pyramid which, being black, is one with the night, but we can still see it because of the city lights reflected in their walls and the strongest beam of light in the world which goes from its tip to the sky . 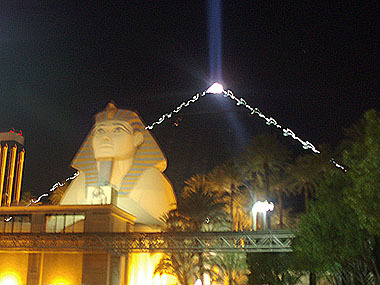 We walk all around the pyramid knowing this is our last visit in Las Vegas, which we’re going to leave tomorrow morning, a city built for offering good times to the visitors and for owners earning big money too. We’re going to bed knowing after the last night in one place is a night in another new one. Tomorrow is going to be for the desert .